This article is about the commonly cultivated herb. For other uses, see Parsley (disambiguation). Parsley or garden parsley (Petroselinum crispum) is a species of flowering plant in the family Apiaceae that is native to the central Mediterranean region (Cyprus, southern Italy, Greece, Portugal, Spain, Malta, Morocco, Algeria, and Tunisia), but has naturalized elsewhere in Europe, and is widely cultivated as a herb, a spice, and a vegetable. Parsley is widely used in European, Middle Eastern, and American cuisine. Curly leaf parsley is often used as a garnish. In central Europe, eastern Europe, and southern Europe, as well as in western Asia, many dishes are served with fresh green chopped parsley sprinkled on top. Flat leaf parsley is similar, but it is easier to cultivate, and some say it has a stronger flavor. Root parsley is very common in central, eastern, and southern European cuisines, where it is used as a snack or a vegetable in many soups, stews, and casseroles. The word “parsley” is a merger of Old English petersilie (which is identical to the contemporary German word for parsley: Petersilie) and the Old French peresil, both derived from Medieval Latin petrosilium, from Latin petroselinum, which is the latinization of the Greek πετροσέλινον (petroselinon), “rock-celery”, from πέτρα (petra), “rock, stone”, + σέλινον (selinon), “celery”. Mycenaean Greek se-ri-no, in Linear B, is the earliest attested form of the word selinon. Parsley is a source of flavonoids and antioxidants, especially luteolin, apigenin, folic acid, vitamin K, vitamin C, and vitamin A. Half a tablespoon (a gram) of dried parsley contains about 6.0 µg of lycopene and 10.7 µg of alpha carotene as well as 82.9 µg of lutein+zeaxanthin and 80.7 µg of beta carotene. Parsley grows best in moist, well-drained soil, with full sun. It grows best between 22–30 °C (72–86 °F), and usually is grown from seed. Germination is slow, taking four to six weeks, and it often is difficult because of furanocoumarins in its seed coat. Typically, plants grown for the leaf crop are spaced 10 cm apart, while those grown as a root crop are spaced 20 cm apart to allow for the root development. Parsley attracts several species of wildlife. Some swallowtail butterflies use parsley as a host plant for their larvae; their caterpillars are black and green striped with yellow dots, and will feed on parsley for two weeks before turning into butterflies. Bees and other nectar-feeding insects also visit the flowers. Birds such as the goldfinch feed on the seeds. In cultivation, parsley is subdivided into several cultivar groups, depending on the form of the plant, which is related to its end use. Often these are treated as botanical varieties, but they are cultivated selections, not of natural botanical origin. The two main groups of parsley used as herbs are French, or curly leaf (P. crispum crispum group; syn. P. crispum var. crispum); and, Italian, or flat leaf (P. crispum neapolitanum group; syn. P. crispum var. neapolitanum). Of these, the neapolitanum group more closely resembles the natural wild species. Flat-leaved parsley is preferred by some gardeners as it is easier to cultivate, being more tolerant of both rain and sunshine, and is said to have a stronger flavor — although this is disputed — while curly leaf parsley is preferred by others because of its more decorative appearance in garnishing. A third type, sometimes grown in southern Italy, has thick leaf stems resembling celery. 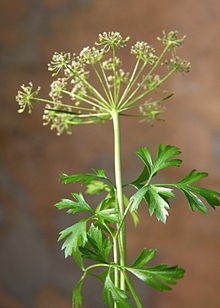 Another type of parsley is grown as a root vegetable, the Hamburg root parsley (P. crispum radicosum group, syn. P. crispum var. tuberosum). This type of parsley produces much thicker roots than types cultivated for their leaves. Although seldom used in Britain and the United States, root parsley is common in central and eastern European cuisine, where it is used in soups and stews, or simply eaten raw, as a snack (similar to carrots). Parsley is widely used in Middle Eastern, European, Brazilian, and American cooking. Curly leaf parsley is used often as a garnish. Green parsley is used frequently as a garnish on potato dishes (boiled or mashed potatoes), on rice dishes (risotto or pilaf), on fish, fried chicken, lamb, goose, and steaks, as well in meat or vegetable stews (including shrimp creole, beef bourguignon, goulash, or chicken paprikash). In central Europe, eastern Europe, and southern Europe, as well as in western Asia, many dishes are served with fresh green, chopped parsley sprinkled on top. In southern and central Europe, parsley is part of bouquet garni, a bundle of fresh herbs used as an ingredient in stocks, soups, and sauces. Freshly chopped green parsley is used as a topping for soups such as chicken soup, green salads, or salads such as salade Olivier, and on open sandwiches with cold cuts or pâtés. Persillade is a mixture of chopped garlic and chopped parsley in French cuisine. Parsley is the main ingredient in Italian salsa verde, which is a mixed condiment of parsley, capers, anchovies, garlic, and sometimes bread, soaked in vinegar. It is an Italian custom to serve it with bollito misto or fish. Gremolata, a mixture of parsley, garlic, and lemon zest, is a traditional accompaniment to the Italian veal stew, ossobuco alla milanese. Root parsley is very common in Central, Eastern, and Southern European cuisines, where it is used as a snack or a vegetable in many soups, stews, and casseroles, and as ingredient for broth. In Brazil, freshly chopped parsley (salsa) and freshly chopped scallion (cebolinha) are the main ingredients in the herb seasoning called cheiro-verde (literally “green aroma”), which is used as key seasoning for major Brazilian dishes, including meat, chicken, fish, rice, beans, stews, soups, vegetables, salads, condiments, sauces, and stocks. Cheiro-verde is sold in food markets as a bundle of both types of fresh herbs. In some Brazilian regions, chopped parsley may be replaced by chopped coriander (also called cilantro, coentro in Portuguese) in the mixture. Parsley is a key ingredient in several Middle Eastern salads such as Lebanese tabbouleh; it is also often mixed in with the chickpeas and/or fava beans while making falafel (that gives the inside of the falafel its green color). ^ “Palaeolexicon”. Palaeolexicon. Retrieved 2018-07-23. ^ “Parsley information on Drugs.com”. ^ Jett, J. W. That Devilish Parsley Archived 2007-06-26 at the Wayback Machine West Virginia University Extension Service. Last retrieved April 26, 2007. ^ “Petroselinum crispum“. Germplasm Resources Information Network (GRIN). Agricultural Research Service (ARS), United States Department of Agriculture (USDA). Retrieved 10 December 2017. ^ a b c d e Stobart, T. (1980). The Cook’s Encyclopaedia. Macmillan ISBN 0-333-33036-6. Chisholm, Hugh, ed. (1911). “Parsley” . Encyclopædia Britannica (11th ed.). Cambridge University Press.